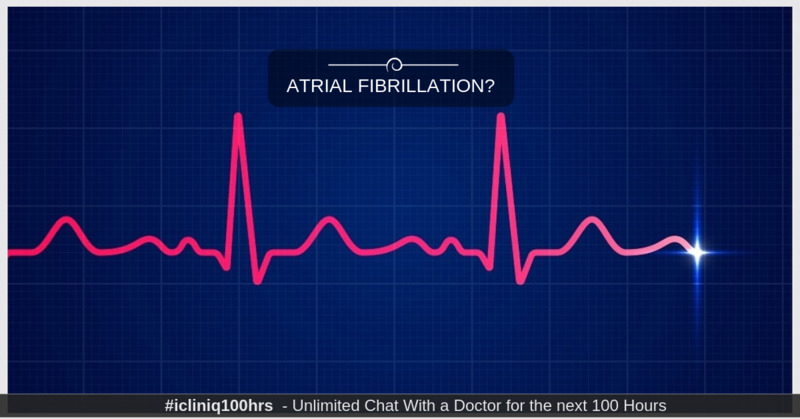 iCliniq › Ask a doctor online › Answers › Cardiology › Atrial Fibrillation › What are the symptoms of atrial fibrillation? Q. What are the symptoms of atrial fibrillation? Last weekend, I ended up in the ER department after an overdose on THC capsules. Very scary experience my heart was going crazy, very bad chest pain, shortness of breath, tremor, etc., for about five hours. I had an ECG done in the hospital which said sinus tachycardia. My blood was taken (all fine apart from low magnesium and potassium), chest X-ray was done (all fine). I was given Diazepam and on discharge had another ECG done and it said sinus rhythm although my heart bpm was still over 100 bpm. The doctor said it is probably due to anxiety and let me go. Two days after this experience, I started getting weird symptoms (slight pain in the chest, lightheadedness). So, I went to my doctor, he measured my blood pressure, heart bpm, etc., all fine but put this machine in between my hands and could see my heartbeat was irregular. He prescribed me Digoxin for five days to see if it would get it under control. I went back again because I was concerned about the lightheadedness, he again measured heart bpm, etc., all fine, listened to my chest and said it is back in more of a regular beat and prescribed Digoxin for five more days and to come back again but at the moment, he is not overly concerned. I think I do not have bradycardia or tachycardia but I think I could have developed Afib from my experience in the hospital, is this possible? Yes, it is possible, but a likely possibility is of ventricular ectopics (or other causes) rather than Afib which could also cause irregular heartbeats on the machine. Even in normal individuals, the machine may falsely show irregular beats. Few points which are against are fibrillations are normal ECG especially if you had it done while having symptoms, even examination by a doctor for pulse and auscultation will help in diagnosing Afib. Also, the pulse rate is expected to vary to a large extent and cross the 100 bpm. You may also feel irregularly beating heart within your chest. Also, you can keep a finger over the pulse and feel irregularity and missing pulse. So, it could be an ectopic which is now settling. The only way to definitely confirm is ECG. If this continues, you may a get an ECG done or buy a home-based rhythm monitor like Alivecor Kardia device which records the ECG for interpretation. So, overall unlikely to Afib, but either ECG or examination by the doctor can confirm this. The other cause for pain in such settings is gastritis or reflux, which can commonly cause such symptoms. Also, ectopics may cause pain as well. Anxiety can also cause similar symptoms. Have plenty of water and adequate intake. If you are having these drugs for a long time then the possibility of withdrawal should also be kept. Hope this helps you and get back if you have any doubts. When I feel my pulse it is normal (to me) and when I look at my chest it seems to be beating normal and in the rhythm I do not notice any irregular heat. However, I am not sure what could be causing the lightheadedness and chest pain which I think is a symptom of an irregular heartbeat. I noticed after being in the hospital that I had some stomach bloating as well which does not seem to have gone down, so perhaps I could also have some stomach issue. Would I need to stop taking Digoxin to get ECG done? I have attached some images. In that case, it is unlikely to Afib (attachment removed to protect patient identity). The reason for symptoms in Afib is high heart rate which leads to low BP and dizziness, shortness of breath and chest pain. And with heart rate well controlled, afib becomes a less likely cause. Also, tracing which you attached appears regular so unlikely to be Afib. There is no need to stop Digoxin for ECG. In fact, I do not see any indication for Digoxin at present as heart rate is well controlled. Have some antacids and consider the possibility of withdrawal as well. Also, get BP checked. Unfortunately, the tracings I have attached was taken when I was on Digoxin who perhaps the rhythm is only controlled with digoxin. Doctor did check my blood pressure, says its normal and BPM is normal (checked twice). Digoxin was only prescribed for the unusual rhythm.At the moment I am trying to take it easy and rest (no drugs, alcohol, caffeine), take magnesium supplements and eat a banana a day for pottasium as bloods showed low levels of both and doctor in hospital was concerned with that. I am going back to the doctor next week when i finish digoxin and if im still unwell I will request another ECG. Antacids okay to take with Digoxin? You may take antacids with Digoxin. But, Digoxin is for rate control than rhythm control. And also initial ECG also showed sinus rhythm when you were not on Digoxin. Also, Digoxin takes time to act, so overall it is unlikely to be Afib and must be sinus tachycardia which was controlled. Repeat ECG if necessary. My concern is that I have done permanent damage to my heart by ending up in the hospital which has now caused the irregular heartbeat and maybe it was not picked up on initial ECG's as they were done when I was in the hospital and not the days after. But I guess I am just very worried and overthinking it as chest X-ray was fine, blood tests were fine and two initial ECG's are fine. I will take some antacids in the meanwhile and try to relax. It is not permanent damage usually. Even if we consider, you had Afib initially, then it was likely a drug-induced due to stimulation by the drug which is reversible in the majority of the cases. Also, the lack of ECG changes makes the possibility of permanent damage unlikely. Rhythm disturbances are transient usually. So, overall, does not appear a worrisome issue. Levels reduced to nearly one fourth after 4 days and it's not therapeutic. So, yes 4 days is sufficient time. Importantly, as I mentioned earlier, digoxin does not significantly help in maintening sinus rhythm, but it's for controlling heart rate. So, you may stop it now and see ecg after 4 days. Delaying ecg by another 2-3 days would be further better. Thanks. I bought an ECG portable monitor and have been testing myself, it always comes up as "possible bradycardia" as I am always under 60 BPM resting. I am only 25 years old, i'm not over weight but i'm not active so not sure if under 60 BPM is okay for me. This is my second day off digoxin so maybe digoxin is still slowing my heart rate. I am still light headed and feel a bit weird, Rhythm looks okay to me though. The rhythm is not good on this. It's junctional rhythm, not normal sinus rhythm. This is probably caused by digoxin and should settle after its effect wane off. So, obtain routine 12 lead ecg from local doctor for confirmation as soon as possible, because monitor sometimes may be fallacious. If possible, upload your yesterdays ecg for comparison. I was back at doctor on Tuesday for 12 lead ECG but i was very very nervous getting it done and anxious and it ended up being sinus tacycardia yet i am never over 100 BPM when i measure myself at home. He measured by blood pressure but it was normal. He is referring me to get holter monitor put in place for 24 hours. I am still bloated and a bit dizzy. I've attached a chest ECG from today, what does this look like to you? This is from EMAY Handheld EKG Monitor (EMG-10) so mighn't be very accurate. This tracing is absolutely fine. Normal rate and rhythm. This type of rhythm will not cause any symptoms like dizziness etc. Sinus tachycardia may be due to nervousness itself, but no harm in holter monitoring. Have some antacids, take care of diet. Just confirm, your hemoglobin is normal. I only had bloods done when i ended up in hospital (23rd February) they said magnesium and potassium levels were low (that was all) however i was hungover in hospital so i think that might have contributed to that. Yes, the tracing is bit unusual, but since this is not the 12 lead ecg these changes may be seen. If you are not on any potassium supplements or potassium rich diet then hyperkalemia is not expected in otherwise normal individuals. If you are on it then you should resume normal diet and get potassium levels done.